WC has written before about the challenges of getting a flattering photograph of Fairbanks. Make no mistake, WC is fond of his homely northern town, but the community just isn’t very photogenic. But sometimes, in autumn, if the leaves don’t immediately blow down after changing, and we’re lucky enough to also get a sunny day, from a certain angle it’s very nearly attractive. Among other things shown in the photo, the Chena River is about at the lowest level we’ve seen this summer, even if the upstream, mid-channel gravel bars are still submerged. The photo was taken on a Friday; on the following Monday the leaves were mostly blown down. Autumn doesn’t linger in these latitudes. And just behind the colors and smells of Fall is the looming behemoth of winter. 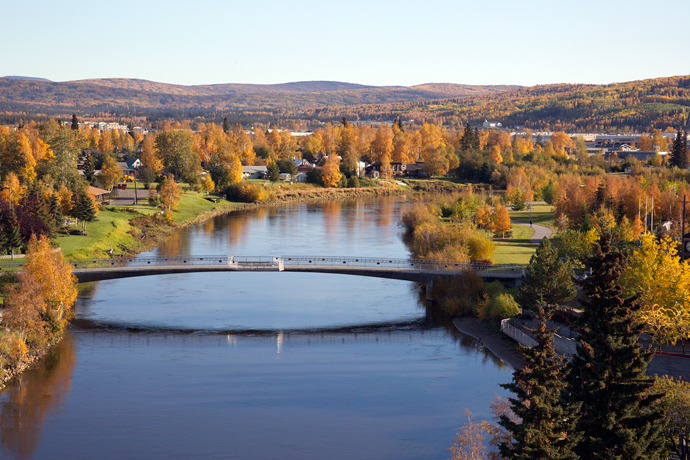 But for those brief couple of days, Fairbanks looks pretty good, eh? Serious props to Fairbanks Festival and Downtown Association of Fairbanks, whose hard work has greatly improved this view.